Detox products: Ovulation Test Strips. Pass drug tests, passing all drug test. The One Step home Ovulation Dipstrip Test will help you find the time when you are most able to become pregnant. It can help you plan your pregnancy. You may do this test at any time of the day, but you should test at approximately the same time each day. Reduce your liquid intake for 2 hours before testing. To decide when to begin testing, determine the length of your normal menstrual cycle. The length of your cycle is from the beginning of one period to the beginning of the next (count the first day of bleeding or spotting as day 1). If your cycle length is irregular, that is, if it varies by more than a few days each month, take the average number of days for the last 3 months. Use the chart to work out the day you should begin testing. The day you begin testing is listed opposite the number of days in your normal cycle. Each test is packaged individually in a sterile pouch bag. 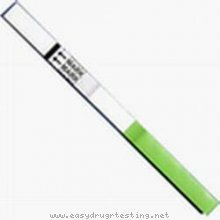 Test Kit includes: 10 tests. Shelf life - 2 years.